The Mars rover Opportunity is preparing to climb out of Victoria crater after spending almost a year exploring its interior. NASA?s Opportunity rover is slowly but surely haulingitself out of a vast Martian crater after nearly a year plumbing the interiorfor secrets of the red planet?s ancient past. Opportunity will take the same route it used to enterVictoria crater on Sept. 11, 2007, after a year of scoutingfrom the rim. Engineers want the rover to make a graceful exit after seeingan electric current spike in its left front wheel — a reminder of a similarspike that occurred when its robotic twin Spirit lost use of a front rightwheel in 2006. "If Opportunity were driving with onlyfive wheels, like Spirit, it probably would never get out of VictoriaCrater," said Bill Nelson, a rover mission manager at the Jet PropulsionLaboratory (JPL) in Pasadena, Calif. "We also know from experience withSpirit that if Opportunity were to lose the use of a wheel after itis out on the level ground, mobility should not be a problem." The rover drove close to the baseof a cliff that makes up part of the crater rim, called "CapeVerde," and snapped detailed images of rock layers reaching 20 feet (6meters) tall. Opportunity's samples of the layers inside Victoriacrater suggest that the wind-blown sediments later met the influence ofgroundwater sometime in the ancient past. The crater itself stretches half amile (800 meters) in diameter and is deeper than any previously seen by therover. "The patterns broadly resemble what we saw at thesmaller craters Opportunity explored earlier," said longtime roverscience team planner Scott McLennan of the State University of New York, StonyBrook. "By looking deeper into the layering, we are looking farther backin time." Neither Opportunity nor Spirit has escaped the ravages oftime and exposure, despite working far beyond the intended 90-daylifespan. 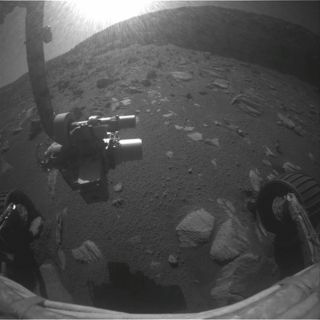 Opportunity currently drives with its robotic arm out of stowedposition, in case a worn shoulder motor stops working and keeps the arm lockedin storage. Opportunity is now gearing up to check on some fist-sizeand larger rocks that scattered across the Martian plains after huge objectsblasted craters deeper than Victoria in the surface. "We've done everything we entered Victoria Crater todo and more," said Bruce Banerdt, project scientist for the rovers at JPL. Spirit has also woken up from its winter hibernation onMars, but will not move from its current haven until enough the available solarenergy reaches increases within a few months. That rover continues to work onits masterpiece, full-circle color panorama while facing the sun from the northedge of the "Home Plate" plateau. Spirit will eventually head south of Home Plate toexamine some bright, silica-rich soil that it discovered last year — possibleevidence of the effects of hot water. The rovers originally landed on Mars in January 2004.